It feels as though you've been transported to an ancient bronze-age settlement, with smoke hanging over a series of primitive roundhouses, whereas actually you've probably just turned off the A3 to see if you can find a handy loo and cafe. 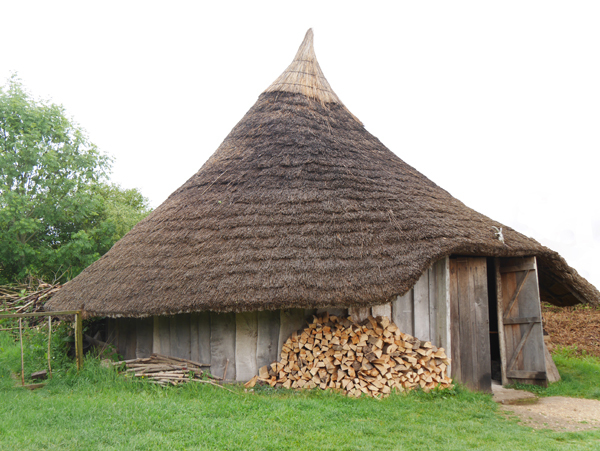 These buildings at Butser Ancient Farm are part of an archeological experiment to test theories about how structures and processes worked in pre-historical times. Buster was established in the early 1970s, when a Dr Reynolds observed that archeological excavations were finding storage pits and no one could be sure whether they would have been effective for grain storage. So Reynolds dug his own experimental pits and filled them with grain, to see if the seeds would remain viable from one season to the next. By sealing in the grain with a clay capping he was able to keep the storage pits airtight and more than a year later his seeds could germinate successfully, demonstrating that these pits were useable for storing seed-corn. He went on to see whether burning the ends of wooden pillars stops them from rotting in the ground (it does!) and these and other experiments were the basis of establishing the Butser Ancient Farm. A few years ago woodlands.co.uk was able to donate some hazel coppice to Butser Farm for the building of a new roundhouse, so I thought it would be interesting to have a look around, as well as use their facilities and buy a mug in their shop. 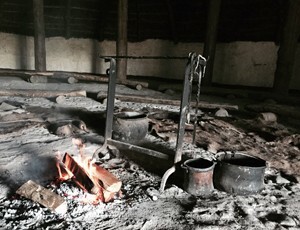 One experiment that gets down to your skin when you visit is about how stone-age men and women would have ventilated the fire in their hut. A common assumption is that a fire in the centre of the hut needs a hole in the roof to create a chimney effect, but this would have risked setting the roof on fire and risked the fire burning too hot. 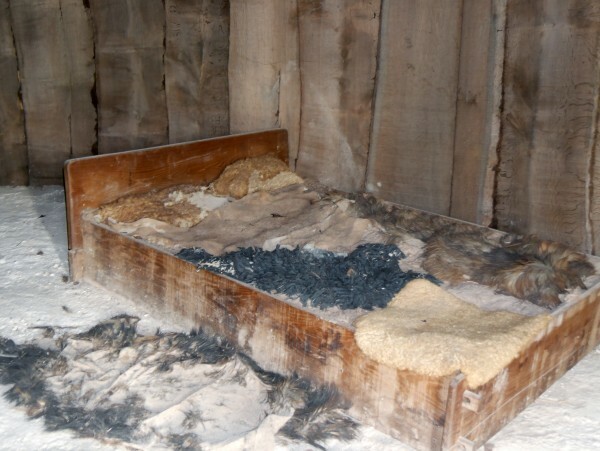 It seems more likely, based on the Butser Farm experience, that a porous roof would have allowed smoke to seep through the thatch - in the process, insects in the straw or reed thatch are killed and the slower rate of ventilation reduces the chance of burning sparks setting light to the roof. But it is smokey, you do come out smelling like a bonfire. 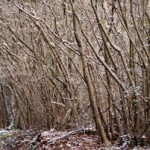 Some of the structures here give good ideas as to what can be built in your own woodland using hazel coppice and green (unseasoned) posts - despite the many centuries since these techniques were developed they are still very useful today. 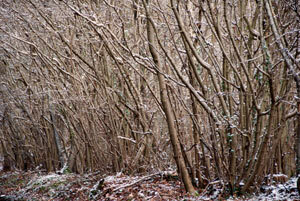 Similarly lots of woodland owners use the techniques demonstrated at Butser to protect their buildings against the weather and against damp or simply to inspire them in pursuing their bushcraft and survival hobbies. 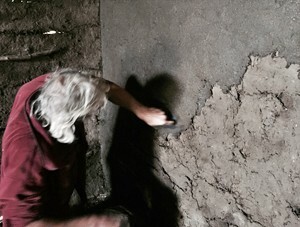 The "farm" is humming with activity, and on the day I visited there was a volunteer plastering the inside of one of the the "neolithic' huts with a mixture that he described as "Cow poo, mud and straw". He was covered in this up to his elbows as the mixture has to be pushed on firmly by hand before being trowelled flat with a wooden float. 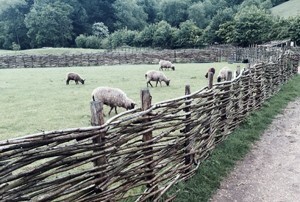 Once it's dry, this mud-poo-straw mix is rock hard and protects the inhabitants against draughts. 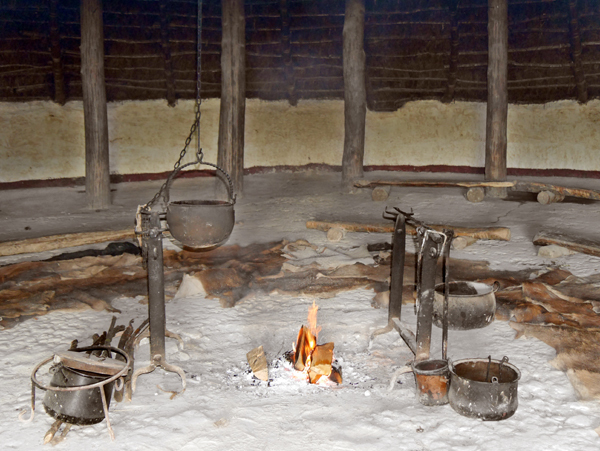 Inside each hut are various ancient furnishings, including pottery, benches, and in one roundhouse a bed covered in furs. The settlement at Butser demonstrates man's transition from nomadic hunter to settled farmer where it became necessary to domesticate animals and grow crops reliably. 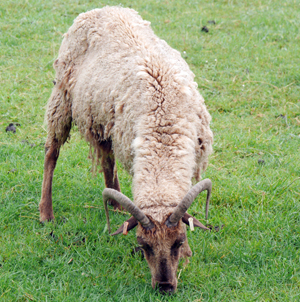 Maureen Page and Simon Jay, who run the farm, keep some early breeds of goats and pigs. Pigs in particular were held in high esteem by the Celts who left numerous bronze figurines of wild and domesticated pigs. As in pre-historic times, at Butser these animals are surrounded by wattle fences made of hazel coppice which have been constructed to keep them in, or maybe to keep out the children. And there are lots of children visiting - about 15,000 each year who explore ancient building techniques, herbal medicine, pottery, wattling, spinning and archeology. Maureen says, "children's imaginations here are immediately activated ... by the end of the day they are often spattered with mud and clay, but they always have beaming smiles."